OS grid reference: SD 8238 3946. 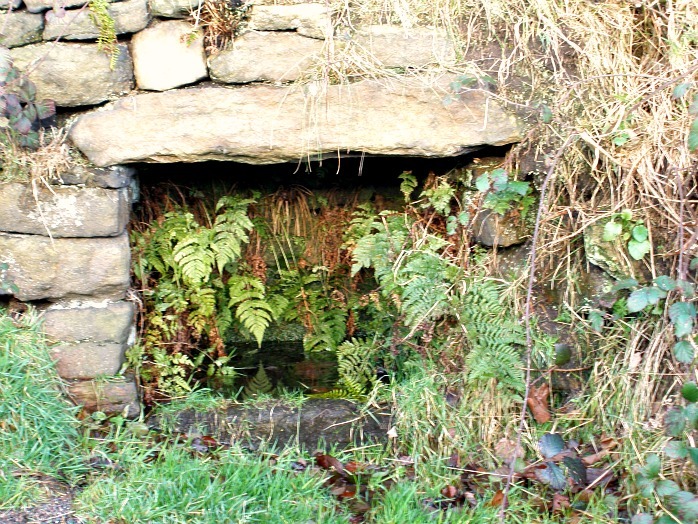 A few hundred yards down the hill from the Pendleside village of Newchurch-in-Pendle along Jinny lane, and set into the grassy bank is Jinny Well or Jennet’s Well, a sacred spring that has been here for some considerable time from when the land was first formed in geological terms. Not a great deal is known about it today, perhaps because in our modern times with clean drinking water on tap, it has been largerly forgotten, sadly. At the time of my visit the well was looking a bit overgrown. From the top of the village Pendle Hill can be seen 2 or 3 miles to the north-west, while the village of Sabden is 4 miles further to the west and Barrowford is roughly 3 miles to the east. 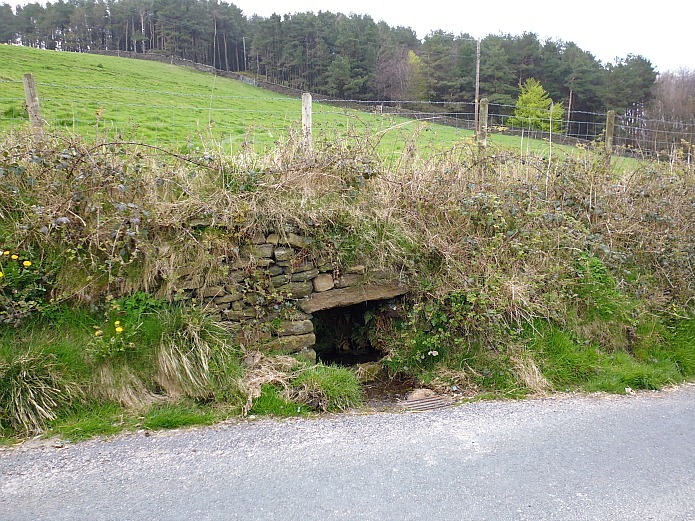 The well is built into the grassy bank at the side of Jinny Lane – it’s roof is formed from a thick stone-slab and a large stone basin collects the water, which is nowadays a dirty-brown colour and “certainly not” suitable for drinking, while at the other side and also above, the structure is made out of drystone walling; the spring comes out of a small grassy hillock in the field above the well. At the front there is a horrid iron grid to collect any overflowing, cascading water. Undoubtedly, at one time long-ago the well water was used by local people because of it’s purity and, maybe it had some health-giving qualities of which we know little about today. According to local legend, the lane is haunted by the headless ghost of a woman called Jinny, Jinnet or Jennet; and she has given her name to the well and the lane, but as to when she lived around here, again, we do not know, only the legend and name remains. Maybe Jennet still uses the well for her needs in the realm where ghosts and spirits (water spirits) preside. Jennet does not appear to have been accorded the title of ‘saint’ in this case, even though she lost her head! There are a few other wells and springs in the pretty village of Newchurch-in-Pendle, in particular there is said to be a well in the garden of St Mary’s vicarage/parsonage. Categories: Holy Wells, Holy Wells / Springs | Tags: Jennet's Well at Newchurch-in-Pendle Lancashire, Jinny Well at Newchurch-in-Pendle in Lancashire | Permalink.